The restoration of a variety of ecological systems located within the NY/NJ region is supported by a wide range of Federal, State, and non-governmental organizations (NGOs). Restoration of bivalves and subtidal habitat is a particularly important goal that contributes to improving water quality and supports commercially important fin fish and invertebrate species, while offering protection to vulnerable coastal shorelines and wetlands. In the brackish marsh ecosystem of the Hudson-Raritan Estuary (HRE), Eastern Oysters (Crassostrea virginica) were historically “Keystone Species”, or ecological engineers. Although today ecologically extinct from the HRE, continuing water quality improvements support reintroducing oysters to the estuary. The U.S. Army Corps of Engineers draft HRE Comprehensive Restoration Plan (2009) calls for establishing 200 acres of oyster reef by 2020. CUES and NY/NJ Baykeeper have been collecting HRE oyster survival and growth data since 2006 and in 2013 will establish a 1/4-acre Raritan Bay restoration research test site at Naval Weapons Station Earle (NWSE). In 2011-12 CUES and NY/NJ Baykeeper lead Citizen-Scientist volunteers in mapping over 30 miles of Raritan Bayshore to determine sites that might one day support oyster reintroduction. Twenty-three parameters were recorded and data was collect every 100 meters. An Oyster Restoration Index Score was calculated for all sampling locations and used to create the Oyster Restoration Survey Map. This map is the first attempt in the HRE to focus reintroduction toward locations that may have a high chance for success, and eliminate sites that are unsuitable. Further scientific vetting is needed before any of these locations could be considered for long-term oyster restoration. Oyster reefs were once a predominant feature of the Hudson River, supporting vast and diverse communities of aquatic life. 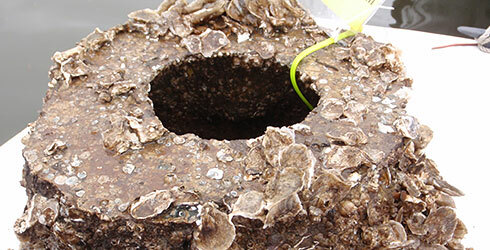 But past decades of pollution and overharvesting led to a decline in oyster populations in the area to near-extinction. In recent years, however, there have been promising signs of recovery. Oysters serve important ecological functions in delicately balanced aquatic ecosystems by filtering small particles from the water. Their reefs also serve as shelter for other marine creatures. Oyster reefs once covered more than 220,000 acres of the Hudson River estuary, but their near-total decline in the lower section of the river has reduced water quality and protective habitat for other animals. To help speed the oyster’s return, the New York State Thruway Authority is partnering with a group of scientists and oyster restoration experts including the Hudson River Foundation, the University of New Hampshire and the NY Harbor Foundation’s Billion Oyster Project to conduct a pilot study of potential oyster restoration methods and materials. Two different habitats are being studied: 400-pound metal cages, called gabions, filled with empty oyster shells; and 200- and 300-pound concrete “reef balls” in. 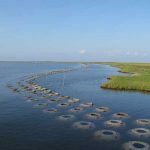 The gabions and reef balls provide hard, three-dimensional surfaces that are intended to attract oyster larvae, support oyster growth and promote overall oyster survival. The study was developed by a working group that also includes Riverkeeper, Scenic Hudson, NY/NJ Baykeeper, Cornell University, National Oceanic and Atmospheric Administration, Federal Highway Administration and the New York State Department of Environmental Conservation. As part of the New NY Bridge project’s environmental stewardship commitments, the Thruway Authority has established an oyster working group (OWG) to help lead the restoration effort. The OWG hopes that the results of this two-year pilot study will allow it to take a smarter approach to oyster restoration. Following the pilot study, a full-scale oyster restoration effort will be launched to establish new hard-bottom oyster habitats in the river using the methods that prove most successful in enabling oysters to flourish. The installation of the test materials was aided by students from the New York Harbor School, part of the project’s ongoing effort to inform and involve the next generation of environmental stewards. Learn more about the project’s environmental mitigation efforts in the Hudson River, including sturgeon monitoring conservation efforts.